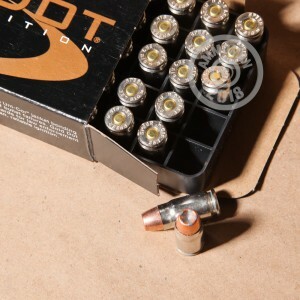 If .357 SIG is your cartridge of choice for self-defense, this case of 1,000 Gold Dot rounds will ensure that you're prepared for both training and carry. 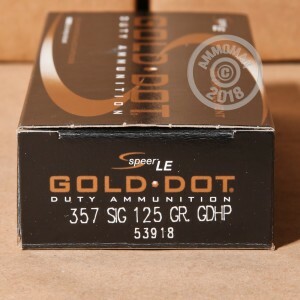 Packaged in 20 boxes of 50, these rounds from Speer use the Gold Dot bonded core hollow point bullet in a version designed especially for the .357 SIG. The light 125 grain bullet results in a very fast-moving, flat-shooting cartridge with decent penetration and great expansion to stop an assailant quickly. It will work great in a Glock 31, Sig P226, or Smith & Wesson M&P. 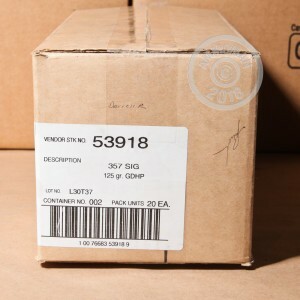 These rounds use non-corrosive Boxer primers from Speer's sister company CCI and reloadable, nickel-plated brass cases. The .357 SIG is a high pressure cartridge that, as its name implies, was developed by SIG Sauer and Federal Premium Ammunition to provide .357 Magnum ballistics in pistols designed for the .40 S&W cartridge. Add more than $99 in items to your cart at AmmoMan.com to qualify for free shipping. You pay only the list price!